The other day, I got two wedding invitations in the mail – and neither one was, alas, for a dog wedding. 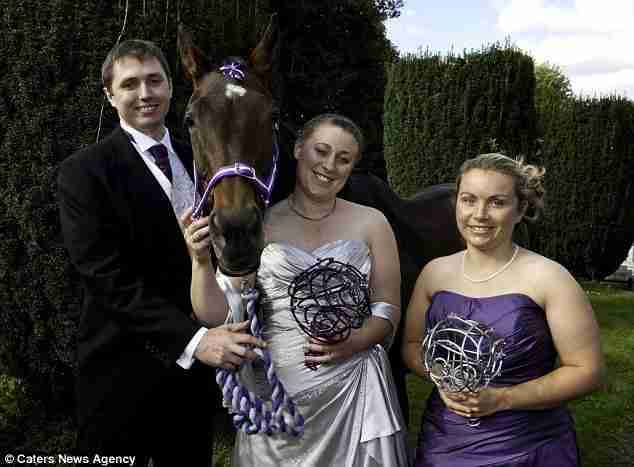 It got me thinking about a story that fascinated me a while back: the true tail – er, tale – of bride Alex Wells, who made her beloved horse Toffee one of her bridesmaids. 1. No griping about the bridesmaid dresses. 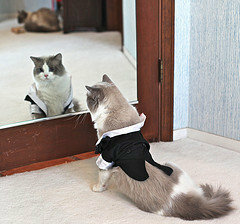 If you manage to put a dress on your animal bridesmaid (without having your eyes scratched/gouged out...which is what would happen if I put any clothing on my cat Ali – trust me, I've tried), it's not like your non-human compadre is going to keep bitching about the cut or color choice. Wells didn't put a dress on Toffee, but she did choose to have her equine pal's mane braided, and had purple ribbons added to it. Toffee also wore purple-and-white tack for the occasion. Maybe Toffee thinks she looks terrible in purple – but no one will ever have to hear about it. 2. No drunken scenes.Sure, they do make for one of the best things about a wedding, but you may not realize that on your special day. At least your animal bridesmaid would (most likely) continue to stand soberly by your side. 3. Totally comforting in a bridezilla meltdown. I've been Maid of Honor at several weddings, and at a few of those, there were some not-so-great moments when the bride just freaked out and started yelling about things that were, well, let's say not really important at all. At least an animal probably won't experience a temporary utter loathing for their bridal loved one – they can just provide some fur (or feathers, or scales, etc.) to cry into. And that's often the best remedy. 4. Add excitement to any wedding ceremony. Not everyone likes to sit through a wedding ceremony, but come on – if there's a horse or dog or something involved, at least that makes things a bit different, and even a little unpredictable. Remember that penguin who peed on the bride's dress at a zoo wedding? I mean, I feel awful for the bride, but I bet her wedding will never be forgotten by anyone who attended. 5. Cool pictures.The same goes for wedding photos. You may give only a passing glance to the photos someone posts on Facebook or has framed in their house – but if there's an animal unexpectedly there, I bet you'll be intrigued and maybe even decide to have a look at the whole darn album. So in conclusion, Alex Wells is not only eccentric, but a total genius.